Victoria Day (in French: Fête de la Reine) is a federal Canadian statutory holiday celebrated on the last Monday on or before May 24, in honour of both Queen Victoria's birthday and the current reigning Canadian sovereign's official birthday. It is sometimes informally considered as marking the beginning of the summer season in Canada. The holiday has been observed since before Canada was formed, originally falling on the sovereign's actual birthday, and continues to be celebrated in various fashions across the country on the fixed date. Royal salutes (21-gun salutes) are fired in each provincial capital and in the national capital at noon on Victoria Day. In Quebec, the same day was, since the Quiet Revolution, unofficially known as Fête de Dollard until 2003, when provincial legislation officially named the same date as Victoria Day the National Patriots' Day. Canadian Confederation (French: Confédération canadienne) was the process by which the federal Dominion of Canada was formed, officially beginning on July 1, 1867. On that date, three British colonies were formed into four Canadian provinces. 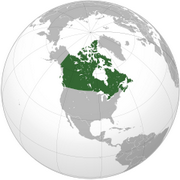 The British Province of Canada was divided into the new Canadian provinces of Ontario and Quebec, and two other British colonies, New Brunswick and Nova Scotia, also became provinces of Canada. The date and location of the first Thanksgiving celebration is a topic of modest contention. The traditional "first Thanksgiving" is the celebration that occurred at the site of Plymouth Plantation, in 1621. According to tradition, the Pilgrims hosted a delegation of about 90 Wampanoag led by a chieftain Massasoit. The Wampanoag are but one of a multitude of distinctive nations that at that time were already living in areas subjected to colonization that eventually became the northeastern United States and southeastern Canada. Although organized violence, epidemics and rampant discrimination often characterized interactions between European colonists and peoples whose ancestors arrived thousands of years earlier, the peaceful harvest festival that became the Thanksgiving prototype created a more benevolent paradigm of possibilities for cooperation; however, these possibilities were often overlooked by both sides in following centuries until the closing of the frontier in 1890. The Plymouth celebration occurred early in the history of what would become one of the original thirteen colonies that became the United States. However, there was another, more modest Thanksgiving at Berkeley Plantation, Virginia on the banks of the James River in 1619. The celebration became an important part of the American myth by the 1800s. This Thanksgiving, modeled after celebrations that were commonplace in contemporary Europe, is generally regarded as America's first. Today, Thanksgiving is celebrated on the fourth Thursday of November in the United States and on the second Monday of October in Canada. Thanksgiving dinner is held on this day, usually as a gathering of family members and friends. Commemorates Canada's war dead. Anniversary of the armistice ending World War I in 1918. Statutory holiday in Alberta, British Columbia, New Brunswick, Newfoundland and Labrador, Northwest Territories, Nunavut, Prince Edward Island, Saskatchewan, and Yukon. In Manitoba, an "Official day of Observance", not a statutory holiday. In Nova Scotia, not a statutory holiday in that employers have the option of giving Remembrance Day or an alternate day off. Not a statutory holiday in Ontario or Quebec.